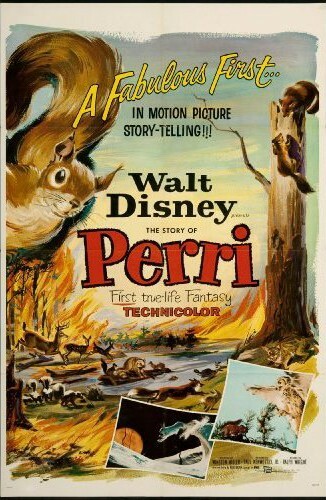 Perri (film) The first, and only, True-Life Fantasy. Directed by N. Paul Kenworthy Jr. and Ralph Wright. Released on August 28, 1957. The story of a little pine squirrel named Perri and her life from childhood to maturity. When Perri’s life is threatened by a marten, her father sacrifices his life to lure it away from Perri’s nest. Now alone with her brothers, she seeks a new nest of her own, and even falls in love with Porro, all the while dodging marten and wildcat. Based on a story by Felix Salten, who had written Bambi, the film was shot in Jackson Hole, Wyoming, and the Uintah National Forest in Utah. 74 min. Nominated for an Academy Award. Animated effects were credited to Joshua Meador, Ub Iwerks, and Peter Ellenshaw, and Paul Smith wrote the musical score. Roy E. Disney, Walt’s nephew, contributed some of the footage.